Your personal finance solutions are right here at Discover Card. You will find what you need to meet your short-term or long-term financial goals from credit card options, savings accounts, loan products, investment assistance and more. Be sure to check back often with 58Coupons to take advantage of the latest in savings, promotions and coupons. Receive $100 cash back bonus when you spend $500 or more and use this code. Click link for details. 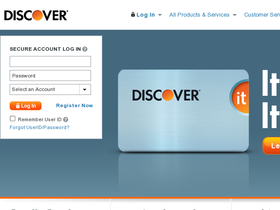 Get a Discover More Card and receive a $50 cash back bonus at Discovercard.com! Some exclusions apply, click link for details. Enjoy a 0% APR introductory rate from Discover Card. Some exclusions apply, click link for details. Click here to apply for your Discover Card and start earning a 5% cash back bonus! Click link for more. Visit DiscoverCard.com and sign up for a card with no annual fees! Click link for details.